When Rick Laubscher was 6 years old, he rode a streetcar to the circus. The San Francisco native is pretty sure he saw the lions and tigers and all that comes with it, but he wasn’t left with much of an impression. So started a lifelong fascination with San Francisco’s streetcars that eventually led to Laubscher playing a key role in the creation of a vintage trolley line through the heart of the city, allowing visitors and commuters alike to ride the rails just as they did a century ago. While perhaps not as recognizable as the city’s famed cable cars, the F-Line of the San Francisco Municipal Transportation Agency (also known as Muni) offers a unique way to take in the sights. Every day, up to two dozen vintage streetcars, many built before World War II, carry people from the Castro District to Fisherman’s Wharf. Reiskin says that Muni is unique because it has two vintage types of transit integrated into its otherwise modern system. The famous cable cars date from 1873 and were designed to climb the city’s steep hills by connecting to a cable that moves beneath the street. The 1906 earthquake destroyed many of the city’s cable car lines and most were replaced with more modern streetcars, which receive their power from an overhead wire. As it did in many cities, the streetcar spurred a huge amount of development in San Francisco. By the 1930s, 50 trolley lines connected every neighborhood, including four sets of streetcar tracks right up the middle of Market Street. Streetcar ridership across the country began to decline with the advent of the automobile. In the 1950s, dozens of streetcar routes were replaced with buses in San Francisco. In the 1970s, the city began to modernize its rail system and replaced its old streetcars with modern light rail vehicles. It also put its Market Street route beneath the main thoroughfare. In 1982, the last vintage streetcars were put into storage. To mark the end of rail service on Market Street, Muni rolled out one of its oldest streetcars for a final ride. It was that ride that gave Laubscher, then chair of the San Francisco Chamber of Commerce’s transportation committee, an idea to organize a vintage trolley festival that would offer rides up and down Market Street on weekends. The chamber took the idea to Mayor Dianne Feinstein, who supported it, but cautioned she did not “want to see any junk out there.” The first festival was an overwhelming success that was repeated for five years, setting the stage for a permanent vintage trolley line through the city. On Sept. 1, 1995, the F-Line opened for service. The F-Line starts at the intersection of 17th and Castro streets, in the heart of the vibrant Castro District, and heads toward downtown on Market Street. Heading east, the trolleys pass the U.S. Mint and within a few blocks of landmarks such as City Hall and Union Square. Near the intersection of Market and New Montgomery streets, the F-Line passes in front of the Palace Hotel, where President Warren Harding died in 1923. After skirting the Financial District, the F-Line rounds a curve toward the small San Francisco Railway Museum run by Market Street Railway, a nonprofit organization that advocates for and supports historical transit in the city. Next stop is the Ferry Building. From here, the F-Line follows the waterfront all the way to Fisherman’s Wharf, a popular tourist destination. Along the way, passengers can take in views of the bay and Coit Tower, a concrete edifice dedicated to firefighters who perished in some of the city’s worst blazes. While the more-modern light rail vehicles in Muni’s fleet may offer a smoother and quieter ride, the experience of riding one of the vintage cars is much more memorable. The vintage cars have wooden benches and the only air conditioning is an open window. While Muni has upgraded the cars with amenities such as GPS and backup cameras, you would be hard-pressed to find anything else from the 21st century when you board. Emma Gonzalez has been at Muni for 20 years and has been working on the vintage streetcars since 2008. She says it’s hard not to fall in love with the old cars, which come in a variety of shapes, sizes and colors. Her favorite streetcar is No. 578, affectionately called the “Dinky.” The car was built in 1896 and looks nearly identical to the hill-climbing cable cars. In total, Muni has more than 50 historical streetcars, many from across the United States, but others hail from England, Italy and Australia. The bulk of the fleet is made up of Presidents’ Conference Committee streetcars, or PCCs, streamlined cars that date from the 1930s. More than 4,500 PCCs were built and used in 33 cities. While some of the PCCs are painted in Muni’s vintage green and cream livery, most are painted in tribute to different cities that used PCCs, including Washington, Boston, Chicago and Philadelphia. “It’s a riot of color, patterns and designs representing all of the different transit agencies,” Laubscher says. Maintaining century-old streetcars is no easy task, Reiskin says. Because of their age, Muni frequently has to make its own parts to keep them in service. However, the agency receives plenty of help from Market Street Railway; Laubscher is the group’s president. 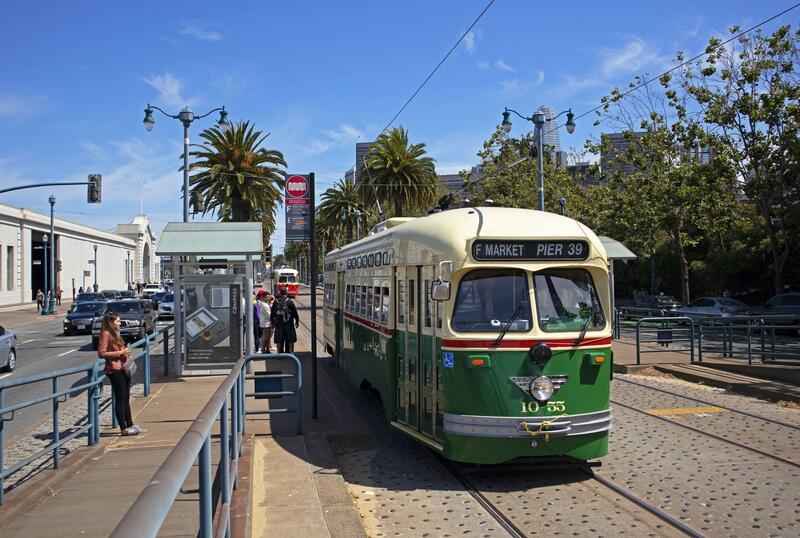 Over the years, Market Street Railway has advocated for the expansion of historical streetcar service, including the creation of the E-Line in 2015 that goes from the Ferry Building toward AT&T Park, home of the San Francisco Giants. There are dozens of museums across America dedicated to streetcars. Some cities have followed San Francisco’s lead and re-created their own vintage lines. However, Laubscher says none of them is quite like the F-Line in San Francisco, particularly because the streetcars are still a critical part of the city’s transit system, one that in addition to carrying visitors takes commuters to work and school.